Highly absorbent. Our beer mats are constructed from a 1.5mm thick open texture wood pulp board for maximum performance in a pub, bar, club, restaurant or coffee shop environment. Top-quality print. Rather than printing directly on to the absorbent surface, which causes fuzzy images and colour imperfections, we print onto a high-resolution paper which is then bonded to the pulpboard core. This achieves photographic print quality on a highly absorbent mat. Flexibility. You can choose from a single faced mat with plain white reverse; the same image on both sides; or different images on each side all at no extra cost. We also offer full-colour and Pantone (spot) colour printing. Variety of shapes. We offer 94mm diameter circular mats or 94 x 94mm square mats with rounded corners as standard. 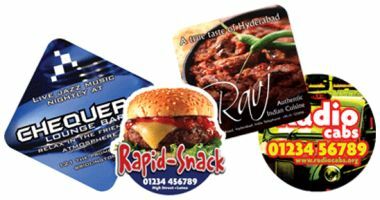 For a nominal fee we can create a cutting forme which lets you choose beer mats of any shape you can imagine. Please see below for example prices. We can produce beer mats to any shape you desire for a one-off forme cost for £85.00. Your shape needs to fit within a 94 x 94mm square. If you require a mat larger than 94mm square, please contact us for a custom quotation. Beer mats are despatched within 4 working days. If your job is urgent we can turn this product around in half of the published despatch time; however, this is subject to a 50% premium because of the additional work involved in rescheduling jobs. If you need to make use of this service please call us on 01457 778788 even if your artwork is not ready, so that we can allocate press space. Beer mats are standard rated for VAT. Right-click the link below and select 'Save Target As' or 'Save As' to download the template to your computer. All of our templates are in PDF format, so you will need suitable software to import and use them. You can request free samples by adding them to your Samples Basket below, or by contacting us on 01457 778788.